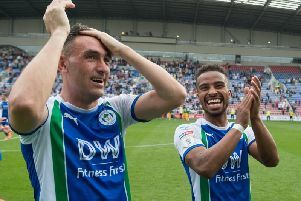 Wigan Athletic star with divided loyalties! Northern Ireland international Will Grigg admits he’s been ‘enjoying’ the World Cup with more than a tinge of envy – but has his fingers crossed England can book their place in the last eight with victory over Colombia. Grigg was born and bred in Solihull, West Midlands, but elected to play for Northern Ireland through the grandparentage rule. Having experienced the excitement of reaching Euro ‘16 in France, Grigg and his country missed out this time. While he remains fiercely loyal to Northern Ireland, he’s been quick to invoke the residency rule when nailing his colours to the mast – especially with the Three Lions going so well! “I’ve been enjoying the World Cup, although it’s disappointing not to be there,” he told the Wigan Post. “The games have been great, there’s been plenty of goals and hopefully there’s more to come. Much of the negativity that often surrounds the national side has been lifted in recent weeks, with Gareth Southgate doing a fine job in getting everyone singing from the same hymn sheet. “Sometimes it’s England it all gets a bit negative, and we’re always looking for an excuse for this and an excuse for that, beating people up,” acknowledged Grigg. Being a striker, Grigg has obviously been impressed with the contribution of Harry Kane, who scored five goals in the first two games, against Tunisia and Panama, before being rested for the final group game against Belgium. “Harry Kane’s doing so well, and I remember when he was loaned out to Leyton Orient, in the lower leagues, around the same time I was a kid at Walsall,” added birthday boy Grigg, 27 today. “Look at him now, doing so well, leading the side – and he’s another who was labelled a one-season wonder.